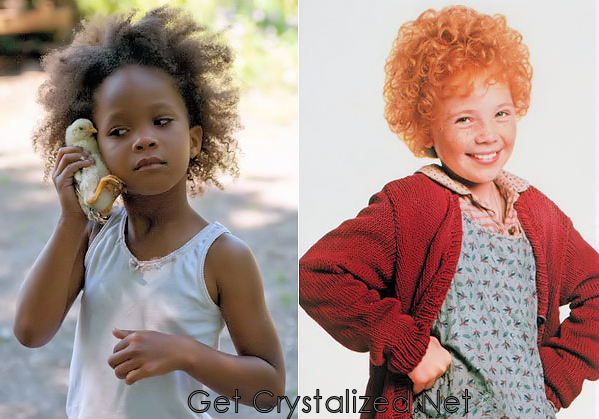 For those of you who are unfamiliar, the original film Annie was a little white girl with curly bright red hair. Wallis is far from that, and the backlash has been impressive. I remember in grade school we put on a production of Annie. I was given the role of the maid. When I came home bursting with excitement over my impending brush with stardom my mother did not share my enthusiasm. In fact, she called the school and told my teacher if I didn’t receive another non-servant role I would not be participating at all. I don’t remember what happened next. Childhood trauma I suspect. That was more than 20 years ago, but apparently, there are still some roles little black girls were born to play, and other roles they’re not. But honestly, what’s really wrong with a black Annie? Wallis is cute and little and based on her previous film work she seems to have the acting chops to pull off the spunky little orphan character without a hitch. I wonder if they’d dyed her hair red would the backlash have been as severe? I had red hair for years. It was very flattering. Of course, I’m kidding – not about having red hair; I was cuuute – but it’s really sad that people are blowing up Twitter talking about how having a black Annie is destroying a classic, and let’s have an all white cast for a remake of The Cosby Show – It’s only fair. But that’s so misguided and unnecessary because we do have that. Modern Family, Silver Spoons, Family Ties, Full House, the list goes on. Most sitcoms feature white families, even though that is no longer an accurate representation of today’s American family. And that’s the point, right? Times are changing. We need to adapt everything – media, TV, film, fashion, business – to suit the new, more diverse world that we all have to live in. People have such trouble opening their minds to new ideas. In this case it’s not even a new idea, since the movie’s a remake, it’s just a markedly new look. It speaks to a common problem in diversity – the perpetual struggle to embrace change, the need to defend by saying the same things over and over with little to no resolution. It’s why I was so interested when I learned about the brain science implications for diversity, the patterns the brain falls into and how difficult, rather, what a shock it is for the mental system to embrace new information. It seemed a more palatable explanation for the seemingly endless loop diversity executives find themselves on than my idea: many people today still think that black skin, or any skin that is not white, automatically comes with a deficit, of intelligence, character, skill, compassion. Folks, minorities in film can do more than play athletes, pick oranges, be maids, crack whores and ethnic gesture-laden best friend types. It makes me sad for little Quvenzhané. It remains to be seen how she’ll do in the film, but already her performance has been overshadowed by a lot of mess that can only detract from her talent. Personally, I’m glad we have a black Annie. It means there are tons of little black girls out there who now know that someone who looks like them can be a star. I totally agree with you. There’s no reason why a little girl, regardless of the color of her skin, shouldn’t play Annie. I always wondered, tough, what happened to the other orphans…were they sent back to their ditches or were they upgraded into society? I always considered Annie’s defining characteristic as being a spunky orphan with huge dreams. I know she’s iconically regarded as redheaded, but that’s never really defined her character. Unlike, say, Anne of Green Gables, where her red hair was integral to much of the grief she got from others at first.